Hi, everyone! Before I share my card, I would like to welcome my newest follower - Amy Seigler - thank you for joining me! Today's card was inspired by MFT Summer School - Complementary Colors at My Favorite Things. The Modern Blooms are layering stamps so I used my MISTI and chose a lighter and darker shade of the two complementary colours. I started stamping the lighter shade of flowers and leaves in the lower left corner. After I stamped one colour, I would flip my cardstock so that the upper right corner was now at the lower left and then I stamped them again. I proceeded with each colour, first light and then dark, continuing to flip the cardstock and stamping until I was happy with the stamped pattern. I die-cut a stitched rectangle from the stamped panel, layered it with a coordinating cardstock rectangle and some craft foam for dimension, and then adhered it back on to the stamped panel. I stamped the sentiment in black and then finished off the card with some punched and die-cut butterflies, accented with cupped flower sequins. Gems were added to two of the flowers. Love the pretty butterflies and flowers and those colors are yummy together. Hi Kitty! Your card is so delicate and sweet! Lovely yellow-purple tones for your complementary colours school work! :D The shades matches perfectly each one to the others, and love the stamping on two panels! very well done!! Love, love, love this color combination! And since I am a butterfly lover, your card really spoke to me. It is absolutely beautiful! Just the right amount of blingy things too! Thanks so much for sharing it with our challenge this week at PIP Challenges. It's always such a treat to see your creations! I totally LOVE the colors and those butterflies! SOOOOO PRETTY!!! 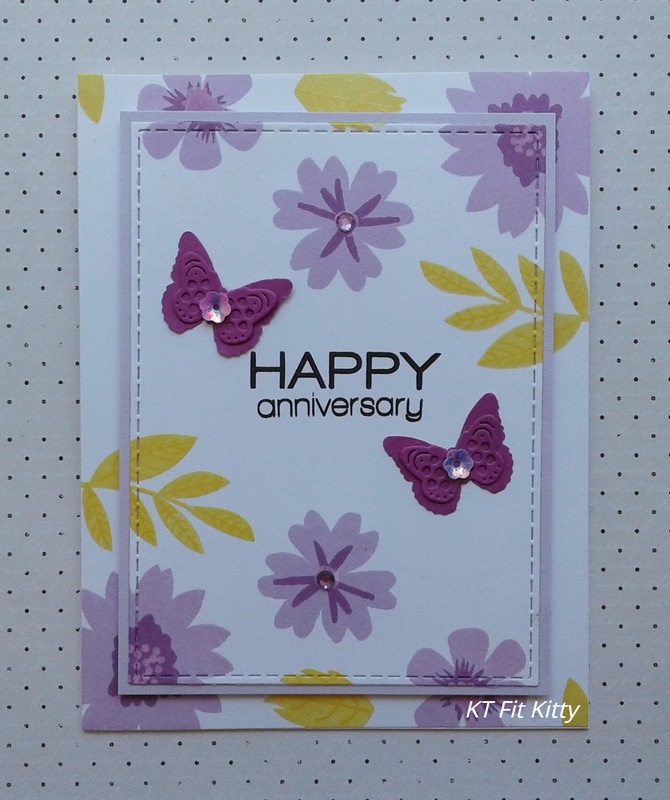 A fabulous burst of colours and such a pretty card, many thanks for joining in with our 'In my Garden' themes at Allsorts and Stamping Sensations challenge. 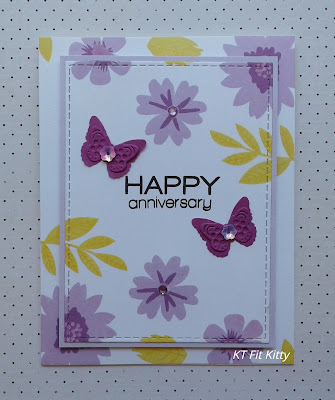 What a fabulous card, great design and your complimentary colors are great together! what a gorgeous card, beautiful colours and fabulous design, I see you are a winner at Stamplorations Woo hoo congrats. So beautifully done, thanks so much for joining us at Allsorts challenge! This is so pretty, lovely colours. How you have used the two opposite colours looks really good. Thankyou for coming and spinning the butterfly wheel with me this week. Hugs Mrs A. Beautiful colors chosen and I love the stamps you’ve used. Love the design and the beautiful colours. 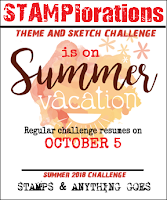 Thankyou for joining us at Happy Little Stamper Anything Goes with Dies Challenge this July, All the best.